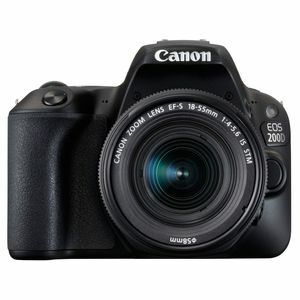 The Canon EOS 200D Digital SLR is a superb starter camera if you're new to DSLR with familiar controls and great image quality, this latest generation of EOS camera has an ease of design for simple use. With touchs creen controls, guided user interface and next generation 24.2 megapixel sensor, the EOS 200D allows you to capture those perfect moments with great quality photos. Use the camera’s bright optical viewfinder to engage with the world, seeing it as it really is. Or touch the Vari-angle screen to shoot in an instant – the world’s fastest Live View AF focuses in as little as 0.03s for pin sharp results. Transfer images wirelessly to your smartphone or tablet computer to edit them and share them with friends. You can also control the camera from your smart device, seeing remotely through its lens and adjusting settings. A Bluetooth link makes it easy to activate Wi-Fi connectivity from straight from your device, without having to touch the camera. Dual Pixel CMOS AF keeps subjects sharp as they move, and you can switch frame rates whilst recording Full HD video. This EOS 200D Kit is supplied with the Canon EF 18-55mm f/3.5-5.6 IS STM lens which is a standard everyday lens and features a versaile zoom range of 18-55mm and a 0.25m close focusing distance. An Optical Image Stabilizer reduces the risk of camera shake which means hand-held photography is posssible in low-light conditions without the use of a flash. If you need to focus on small objects, this EF 18-55mm lens has a close focusing distance of just 0.25m. The non-rotating front element means the use of filters is simple, also the manual focus ring enables manual override of focusing at any time you like. Super Spectra Coating is used to reduce the flare showing in images and also improves sharpness.